I just found another bug in the rewritten 1.4.x resolver, and as much as I want to fix it (and I will)… part of me can’t help thinking if you encounter this bug, your code has greater problems than mine. Believe it or not, it compiles… and the 1.4.1 resolver works perfectly and correctly identifies who’s who and who’s calling what. Now what if we added a recursive call? The bug here, is that this Foo gets resolved as a call to the local variable, so renaming the procedure to DoSomething would leave that Foo unchanged. However, it gets worse: if we change Sub to Function, in the name of being able to identify a function’s return value, a matching identifier within the body of a function (or property getter) is resolved to the function (or getter) itself… so this part needs to be refined at bit. 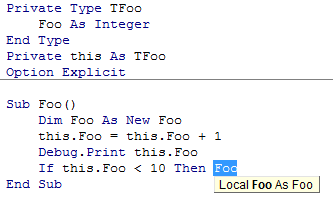 Every single Foo here, with the sole exception of the local declaration, resolves to a reference to the function. I hope this bug doesn’t affect your code… for your sake – and that of whoever will be maintaining your code in the future. If it does… v1.4.2 with certainly include a fix for this issue.